WeBuzz web IM v20100402 update has been rolled out: Fixing bugs, improving connectivity and performance for IE users. Some users reported that webuzz.im is blocked by their networks. In such cases, we recommend you and your friends to visit our latest mirror services on http://kexmail.com/z.html . Please check these servers one by one if you find your network blocked WeBuzz.IM. And don’t forget to give feedback. We would like to hear your problems and give our helps. – – We buzz together @ WeBuzz.IM . We are dedicating to build web IM services with better security, accessibility and user experience. P.S. http://kexmail.com/ is the server providing KeX Mail service, which is the same web email service of WeMail that is provided by http://webuzz.im/mail/ . We are very pleased to announce that WeBuzz.IM now supports Facebook Chat. 2. Change username, check availability and confirm about your username. 3. Logout and login again to make the username working. If you do not logout and login again, you still can not login to Facebook Chat outside its official website. Please report bugs and let us know about your thought. We are very happy to announce that our KaKooLa ( [ka:’ku:la:] http://kakoola.com/ ) service is online now. About 3 months ago, we launched WeBrowse, a social browsing service providing funny or beautiful photos for our visitors. We embedded WeBrowse service in WeBuzz.IM homepage, so our users can enjoy those photos which are collected by millions of Chinese people. KaKooLa is the same services of WeBrowse, but adding more. Besides photos, we add videos and text posts into the list. And a lot more posts are collected. Former WeBrowse has some thousand photo posts. And now KaKooLa has more than 100 thousand posts. And KaKooLa has a new page layout for fast browsing. You can choose your language in the upper-corner language box. Enjoy web browsing at KaKooLa. Have funs. 1. We has upgraded WeBuzz.IM services. So our servers now accept more connections and provide stabler chatting experience. 2. We has added two more mirror server domains for WeBuzz.IM web chatting services: http://java2script.net/ and http://java2script.com/ . We are always improving our web IM services, please give us your opinions to make WeBuzz.IM much better. WeBuzz.IM has rolled out another update v20090919, hiding description texts and hiding logo panel to leave more room.In a result, you may find your chatting background is much cleaner, and you can enjoy a happier web chatting experience. 1. Hiding description text automatically for those old users who use WeBuzz.IM for more than 3 times. Here are two pictures to show the differences. 2. We support another option to hide IM main window’s logo panel. In a result, you may get longer friend list. In some earlier updates, we have already removed ads from chatting dialog and we will automatically hide our bottom quick launch bar and tray task corner. All those changes are following the principle of leaving more room for web IM chatting. We always take improving web chatting user experience as the most important job for WeBuzz.IM. Please give us feedbacks to make improvements. We are very pleased to announce that WeBuzz.IM supports web Jabber/web XMPP ( http://webuzz.im/jabber/ ) from now on. 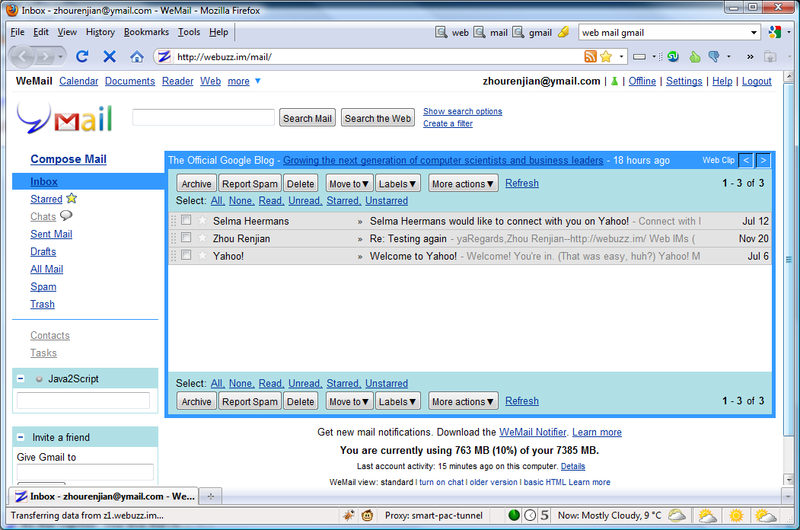 And WeBuzz.IM’s web Gtalk is improved to support Google Apps users. Jabber/XMPP is an open and widely used IM protocol. The well know Google Talk is using Jabber/XMPP. And there are lots of jabber servers besides Gtalk and jabber.org server . You can google “jabber server list” for more jabber servers. 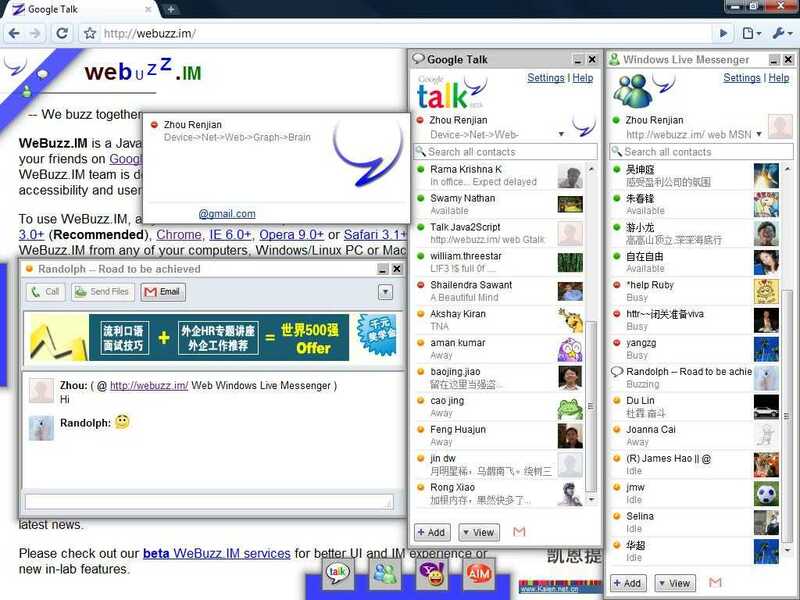 It seems that lots of server provide Gtalk/MSN/AIM/Yahoo! Messenger/ICQ/QQ gateway for its users. To learn more about Jabber/XMPP, please visit http://jabber.org/ and http://xmpp.org/ . To login your jabber, you should login Jabber with full email address. The string “<user name>@<jabber server name>” will tell WeBuzz.IM that you want to login jabber server with your user name. We also improve our web Gtalk service to support Google Apps users. You can login Googl Talk with extra “@<your domain>” in the username field to tell WeBuzz.IM that you are using different email rather than those “@gmail.com”.